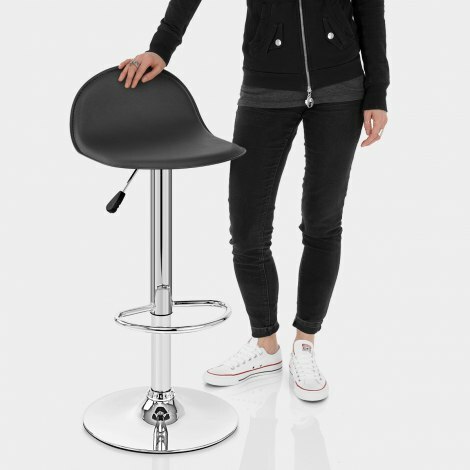 The Cap Chrome Stool Black is a fantastic piece of minimalist furniture, with a simplistic one-piece seat reminiscent of a cap, as the name implies. A subtle design that will match well with any decor, it’s suitable for both contemporary kitchens and traditional breakfast bars. The accommodating padded seat is covered in beautiful black faux leather, its rounded shape mirrored in the low semicircular backrest that flows up in a seamless curve for added support. 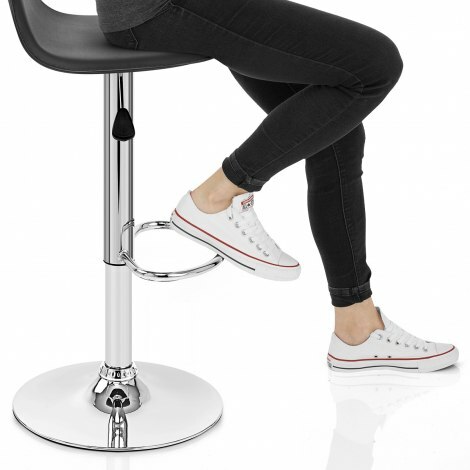 A height adjustable gas lift and 360 degree rotating mechanism lends added functionality, whilst a chromed footrest sits on the circular column, just above the rounded base that comes with a rubber floor protector. This base keeps the Cap stable and gives reassurance of the quality of the stool, as well as keeping your floor free from scrapes and scratches. Arrived ahead of time. Very well packaged. Easy to assemble. Look good and excellent for a smaller space but very sturdy. I would highly recommend them. I’m absolutely over the moon with the stools. I had to search and search to find the perfect ones for my kitchen. I only wanted a small depth seat because I only had a 31cm overhang on my island and I didn’t want the seats to be jutting out too much because there is only a short distance between the island and the kitchen unit. I am still able to work on my island comfortably in front off the stools. The size and price does not compromise the look or the comfort. The service was excellent too with so much choice. Would definitely recommend. Thank you. I have been looking for a long time for an appropriate size bar stool for my small kitchen. Finally found this Very nice and cute Cap Chrome Stool Black. I am happy with the purchase. The bar stool is easy to set up. The size is just right for my small kitchen. Very happy with my purchase my delivery came the time they said it would and delivered by a very nice and Cheerful Guy. I put my stool together myself.... that’s how easy it was ! And it looks very stylish at my breakfast bar. One happy customer!